Can you confirm these amateur observations of Cuora pani? Comment Cuora chriskarannarum has been synonymized with Cuora pani by McCord & Iverson (1991). Little or no mitochondrial DNA variation was found among the morphologically distinct species Cuora aurocapitata, Cuora pani, and Cuora trifasciata (STUART & PARHAM 2004). Cuora aurocapitata and Cuora pani are very closely related or even conspecific (McCord & Iverson 1991, Stuart & Parham 2004) and some authors treat both taxa as subspecies (Artner 2004, Blanck & Tang 2005). 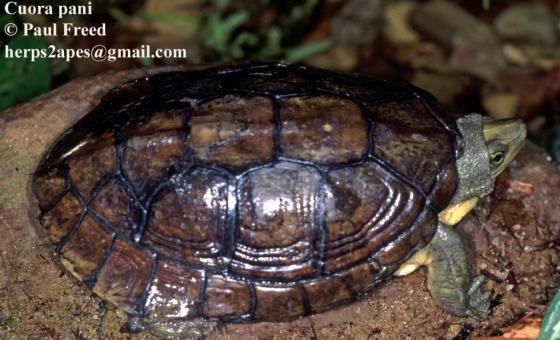 According to SCHILDE (2004) the type locality of this species is not known. C. trifasciata and C. pani are paraphyletic (SPINKS et al. 2007).